Want an entirely new way to read about our nation’s history? we remember from high school or college. Santa Barbara, California (July 13, 2018) – Generally, history is written by people with different agendas. Commentators twist words. Interpretation and perspective twist the narratives. Facts become blurred. Details are lost. Exaggerations are made. Not so with Dead Serious and Lighthearted – The Memorable Words of Modern America – Volume I (1957-1976), Volume II (1977-1993), and Volume III (1994-2015) by Mack W. Borgen (Schmitt & Brody Publishers, Santa Barbara, CA, (Volume I Release Date: March 27, 2108; Volume II Release Date: August 13, 2018; Volume III Release Date: January 15, 2019). These words are not presented in furtherance of any agenda other than to identify recognize and explain those words that have had a direct impact upon our American conversation. Written in an accessible way, the respective volumes of Dead Serious and Lighthearted carefully identify who said what and when and where – exactly. The “memorable words” of Modern America – both the “dead serious” and “lighthearted” words — are carefully selected and well explained. This tightly written book using America’s and American’s own words can help us know our country, and, depending upon one’s age, help us to either better remember or better understand who we are, who we were, and from whence we came. The second volume presents the words from 1977 until 1993 — the middle years of Modern America; from Star Wars “may the force be with you” to Nicholson’s “you can’t handle the truth;” from the lightness of Happy Days to the edginess of Roseanne; from the efforts of Carter to the rise of Reagan; from the Go-Go financial markets of the 1980s to the fall of Communism; from the emergence of modern conservatism to the impacts of globalism and technology. The third volume presents the words from 1994 until 2015 — the last years of Modern America — the years of Clinton, Bush, and Obama and the rise of acrimony and partisanship; the tragedy and terror of 9/11 and the wars in Iraq and Afghanistan; the lightness of Forrest Gump and the humor of Seinfeld; the pain of “Hands Up! Don’t shoot!” and the complexities of wealth inequality. Mack W. Borgen is a native of Montana and was raised in the Pacific Northwest and the Midwest. Upon graduation from the University of California at Berkeley with Honors in Economics, he delivered one of the last University-wide Commencement Addresses. He is a graduate of Harvard Law School and later served more than four years in the U.S. Army. In 2008, he partly withdrew from both business and his law practice in order to devote himself to the writing of a long-planned series of books about the current American condition and about how we, as a country, can do better. His first two books, The Relevance of Reason – The Hard Facts and Real Data about the State of Current America (Volume 1, Business and Politics and Volume 2, Society and Culture) won multiple national book awards. 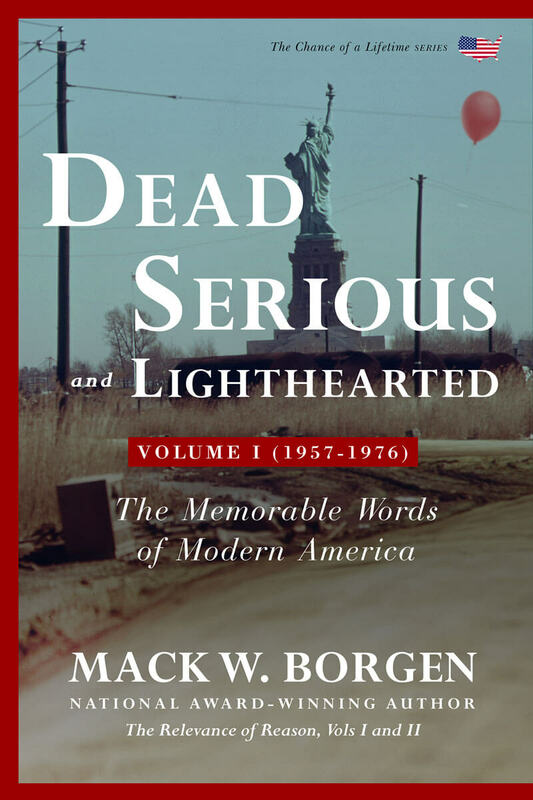 For a review copy of Dead Serious and Lighthearted – The Memorable Words of Modern America or to schedule an interview with Mack W. Borgen, please contact Schmitt & Brody Publishers at SchmittBrodyPublishers@gmail.com or contact Mack W. Borgen directly at 805-450-2602 or mwborgen@live.com. When requesting a review copy, indicate print or PDF. This book presents history in a more accessible and engaging way. It recognizes that words are the very currency of American life ―our tools of communication and rally; encouragement and persuasion; and observation and critique. It accepts that because history is strapped to our backs, an understanding of our country’s history is a central component of our national community. And it reveals that history has to be taught differently and that knowing who said what, where and when is a far lighter way to learn (and for some of us, to relive) the many pieces of our country’s recent past. The first of three volumes, Dead Serious and Lighthearted Volume I (1957-1976) carefully presents the Memorable Words of Modern America – those words, which by their prescience, passion, eloquence, or raw wisdom reveal our country and frame our history. Included herein are the fascinating and the frivolous, the tragic and the momentous, the successes and the failures; the eloquent and the bumbling; the folly and the humor; the predictions and reflections; the toil and trouble; the life and laughter; and the touching and the endearing – from Ike to Obama, from Lucy to Lady Gaga. The words are carefully presented. Each entry is followed by an identification of the speaker or writer and the words’ place, context, meaning, and consequence. The Memorable Words are presented chronologically and just as they arrived―commingled and disjointed, with each entry and event overlapping or overlaying one another. Also included are many of the other more “lighthearted” words of our American life―the titles of the most well-read and most frequently banished books; the most-watched or critically-acclaimed movies and television shows; and even the chants and slogans of political campaigns and the taglines of major product marketing campaigns. These books are written without agenda but with an unbending acceptance of the fact that our country, for the first time in its history, is crowded by the presence of four generations―each dangerously unknowing (in some cases, blithely and dangerously uncaring) about the events that formed the perspective of their predecessor or successor generations. These Memorable Words can help us know our country and better remember who we are, who we were, and from whence we came. It is of little news that America is in an edgy era; that Americans are out of step from one another; that too often people with different opinions are viewed with suspicion, if not disdain. Our people are too often subjected to fear, verbosity, and bluster. But even a gentle reading of these Memorable Words may allow us to tone down the cacophony of our conversations. In that manner, it is hoped that this book, at this uneasy time in our history, may help to bring us together, lower our voices, raise our spirits, and renew our hopes by merely reflecting upon whence we came as a nation. Dead Serious and Lighthearted can help us better remember what has been achieved, so that, in turn, we may be able to better accept and embrace what now must be done. This first volume of Dead Serious and Lighthearted presents the memorable words of Modern America – exactly, from 1957 until 1976 – from American Bandstand to The Godfather, from Lucy to Charlie’s Angels and Rocky’s call of “Yo Adrian!”; from the end of the Fifties through the wildness of the Sixties, from the ascendancy of the Civil Rights, feminist, and environmental movements through the tragedy of Vietnam and the disgrace of Watergate. In the same manner as Volume I, this book presents the history of the middle years of Modern America in a more accessible and engaging way. It recognizes that words are the very currency of American life ―our tools of communication and rally; encouragement and persuasion; and observation and critique. It accepts that because history is strapped to our backs, an understanding of our country’s history is a central component of our national community. And it reveals that history has to be taught differently and that knowing who said what, where and when is a far lighter way to learn (and for some of us, to relive) the many pieces of our country’s recent past. 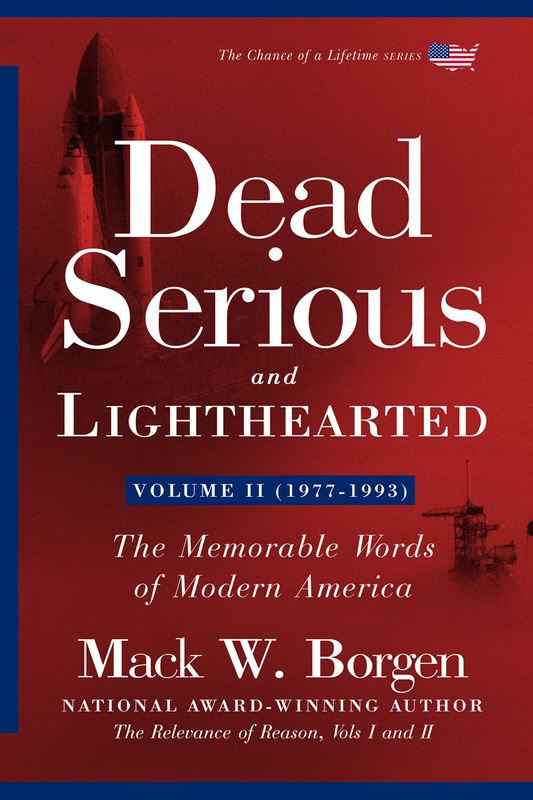 The second of three volumes, Dead Serious and Lighthearted Volume II (1977-1993) carefully presents the Memorable Words of Modern America – those words, which by their prescience, passion, eloquence, or raw wisdom reveal our country and frame our history. Included herein are the fascinating and the frivolous, the tragic and the momentous, the successes and the failures; the eloquent and the bumbling; the folly and the humor; the predictions and reflections; the toil and trouble; the life and laughter; and the touching and the endearing – from Ike to Obama, from Lucy to Lady Gaga. This second volume presents the words from 1977 until 1993 – from Star Wars’ “may the force be with you” to Nicholson’s “you can’t handle the truth;” from the lightness of Happy Days to the edginess of Roseanne; from the efforts of Carter to the rise of Reagan; from the Go-Go financial markets of the 1980s to the fall of Communism; from the emergence of modern conservatism to the impacts of globalism and technology. This second volume of Dead Serious and Lighthearted presents the memorable words of Modern America – exactly, from 1977 until 1993 – – from Star Wars’ “may the force be with you” to Nicholson’s “you can’t handle the truth;” from the lightness of Happy Days to the edginess of Roseanne; from the efforts of Carter to the rise of Reagan; from the Go-Go financial markets of the 1980s to the fall of Communism; from the emergence of modern conservatism to the impacts of globalism and technology. After taking on the task of creating a better future for our country and our people in his award winning books, The Relevance of Reason: The Hard Facts and Real Data about the State of Current America Volumes I and II, Mack W. Borgen is currently on a mission to reframe modern American history in his next series of books titled Dead Serious and Lighthearted: The Memorable Words of Modern America. Mr. Borgen has been a devout student of American history and practitioner of law for nearly four decades. For more than twenty-five years he wrote political and social commentary newsletters and essays, which were distributed privately to hundreds of friends and colleagues. During short stints, he taught history of the labor movement at Rutgers University and history of the Supreme Court at University of Virginia at Charlottesville. He began working on his collection of memorable words, drawn from thousands of books and magazines, including both progressive and conservative, in the fall of 2013. The idea originated from many sources but partly from his sense that our nation is in an era characterized by politicization of far too many issues. In his view, except for a few notable exceptions, American history is poorly taught and rarely learned. And now, for the first time in our country’s past, we are living side by side with four generations, each with their own respective memories, perceptions, and biases. One of Mack’s pet phrases is that ‘history remains strapped to our backs,’ and knowing our shared history is one of the few key ingredients to the preservation of our national community. A native of Montana, Mack was raised in the Pacific Northwest and the Midwest. He has traveled to all corners of America, preferring cars over planes because, as he says, the country can never be truly experienced from 35,000 feet in the air. Mack attended two of America’s greatest universities: University of California at Berkeley and Harvard Law School. Fifty years before its time, he wrote his law school thesis proposing the U.S. adoption of a system of wealth taxation rather than income taxation. He also served more than four years in the U.S. army before leaving the service as a captain. Recounting some of his wilder adventures, he has canoed down the Snake River in Yellowstone, hiked solo as a young seventeen-year-old in the Sierras, and lived in a small coast town in the Costa Brava in Spain where he first planned to become a writer and “explain the Sixties.” Still, there’s a chance he hasn’t done his craziest thing yet. 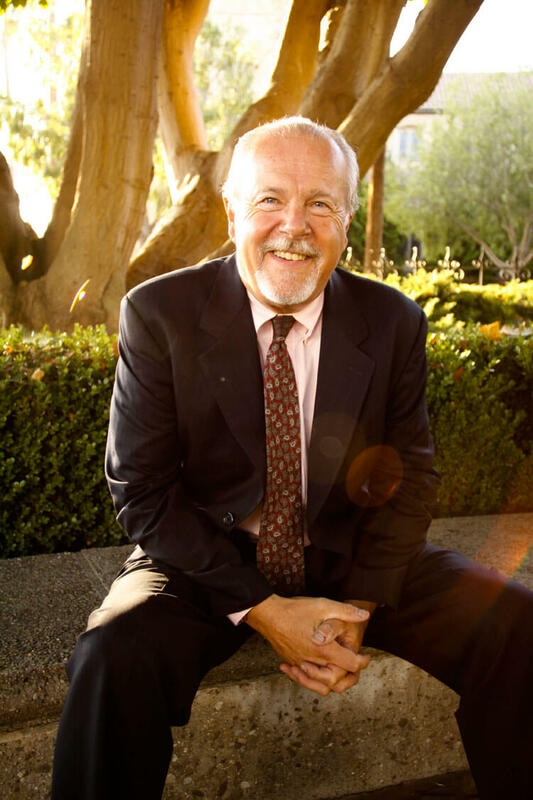 Mack lives with his wife and son in Santa Barbara, California. When not at his desk writing, he enjoys family dinners, playing basketball with his son and, and not having to walk the dog. 1. What prompted you to write a series of books that reintroduces the teaching of Modern America history? For many reasons—the most important reason for the writing of these books is to seek to re-engage Americans in better and more easily learning our own recent history. The regrettable truth is in Modern America, history is poorly taught and rarely learned. There are some notable and deserved exceptions. There are some brilliant historians and devoted writers, but for most Americans, the sad truth remains – American history, burdened by thick books and olgies and isms, is poorly taught and rarely learned. Also, for the first time in American history, our country is being shared by four separate generations — each with their own separate and distinct recollections, perspectives, biases; each with their own peculiar wisdom, knowledge and ignorance. This makes understanding our recent history, more—not less—important since the perspective of each living generation is entirely unique. 2. What incident from your growing up years impressed upon you a lack of excitement about learning of history in our education system? I was lucky. I was blessed with access to a tremendous public education. However, even in my schools I, like so many other students, questioned the relevance of “history” to my then-contemporary life. Only later did I come to realize how history, properly introduced, could be a reminder, a guide, and sometimes even a comfort to understanding American life. 3. What have your extensive travels throughout the U.S. taught you about history? My travels have helped remind me about a particular dimension of history. As with many Americans who have been on the road, my travels continually remind me how America cannot be seen from an aircraft flying at 35,000 – or, for that matter, by even a car speeding at 65 miles per hour. I respect the press of schedules and I appreciate the seeming relentlessness of American life, but both our leaders and our citizens must take the time to travel slowly; to learn the condition of our peoples by seeing rather than reading; and to physically see the country rather than watching the news and reviewing data charts and Powerpoints. 4. What do you want your readers to gain from reading Dead Serious and Lighthearted? A number of things: First, the books reveal how quickly things can change – that which is good, can turn bad. Quickly. Possibly more importantly, that which is or has become bad, can turn good. Again. Secondly, the books may help us remember how much fun there has been in our lives. History is not just a litany of long-ago battles and tales of long-dead white men. History comes in all forms and from all directions – and it comes fast – a new page every day, a new chapter every week, a new book every month. It is hard to keep up, but it is almost dangerous not to try. Thirdly, the words of Modern America — exactly who said what, when, and where – might, in a small way, help us to lighten up; to regain our spirit; and to rejoin one another as a part of a national community. In that sense, these books contain a certain unique longevity and agelessness — the words that were actually spoken will not change; the history associated with those words will remain unaltered. 5. What are some of the topics covered and what do you mean by Dead Serious and Lighthearted, which is the main title of your book? 6. What kind of research went into compiling the “memorable words?” How long did it take you? The “memorable words” are drawn from many and varied sources — books, news and magazine articles, compendiums and collections, and data research. The books are written without political agenda, and they scrupulously seek to be balanced with a wide reach of many speakers and writers. The books took more than four years to write, although at least theoretically the project is never done since with the clarity of hindsight some words fade in historical importance while the importance of others grow due to, for example, their later-discovered prescience or historical impact. 7. In terms of today, what are the difficulties or having four generations of Americans living side by side and how do you imagine this will be perceived in the future? The difficulties are endless from many perspectives. For example, every American over the age of 18 has a vote, but the personal history reflected in every such vote is vastly drawn. For example, in the case of our most senior citizens, World War II and Korea remain a component of their perspective. The votes of many Baby Boomers are still influenced by the Vietnam War, the Civil Rights movement, and the remembrance of the years of protest and counterculture of the Sixties. Contrariwise, with many Millennials, anything before the Internet is suspect, and if you can’t Google it, it doesn’t exist. And yet somehow, it remains both our goal and, in my opinion, our necessity to forge the distinct generational components of our American life into a mutually understanding and respecting community. From whence we have come is unalterably an echoing part of American life. 8. Why do you believe it’s critical in today’s political climate to have a solid understanding of Modern American history? There are a myriad of reasons. Possibly, most importantly, there are two reasons. First, properly learned, history can be fun. Secondly, in the context of our shared contemporary life, it – almost better than anything — can bring down the level of cynicism and distrust; tear down some of the isolation; de-politicize many components of America so that we don’t converse with absurd caution while listening for “code words.” In the context of politics, this is most commonly discussed in the context of our democracy’s need for compromise, tolerance, and bipartisanship – themselves, deadly words today. Very bluntly, we, in our humble roles as American citizens, don’t really get to ignore what is happening. Withdrawal and expatriation are rarely desired or feasible for most Americans, and therefore it is hard – or at least dangerous — to ignore society or deny the relevance of the communities which surround us. We don’t need to stand our ground and fight. But, but it may be good to stand our ground and listen better — America, even Modern America, has a history which we need to understand. And knowing what was said or written, by whom, when and why, exactly, might help us remember more accurately and move forward more wisely.